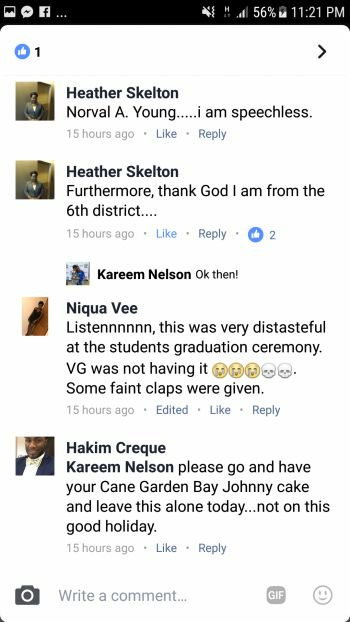 VALLEY, Virgin Gorda, VI - Several residents across the territory have been taking swipes at political leaders, blasting them for shifting the focus from students to do their politicking at graduations. One of the strongest attacks via social media was meted out to Dr The Honourable Hubert O'Neal (R9), who gave remarks at the graduation ceremony of Bregado Flax Educational Centre- Secondary Division on June 29, 2017. The criticisms of Dr O’Neal came on Facebook after he announced at the graduation ceremony a major project for Virgin Gorda that is allegedly without the community’s input. He was particularly perturbed by the fact that there was no prior discourse on the subject with residents. "No public consultation, no views of the residents who will have to live with noise, influx of people, the inconvenience of commercialism in their backyards, etc. 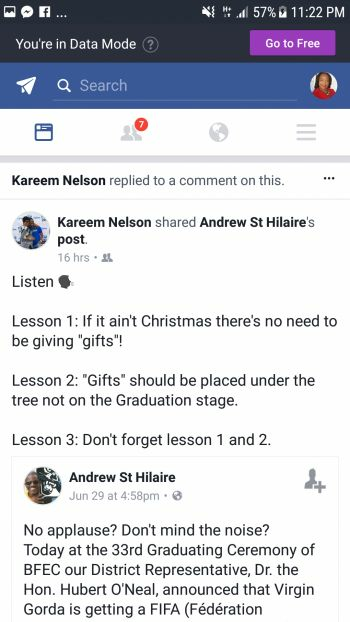 but this is the best thing for VG since Little Dix Bay. Will event goers park in a Sky Car Garage? 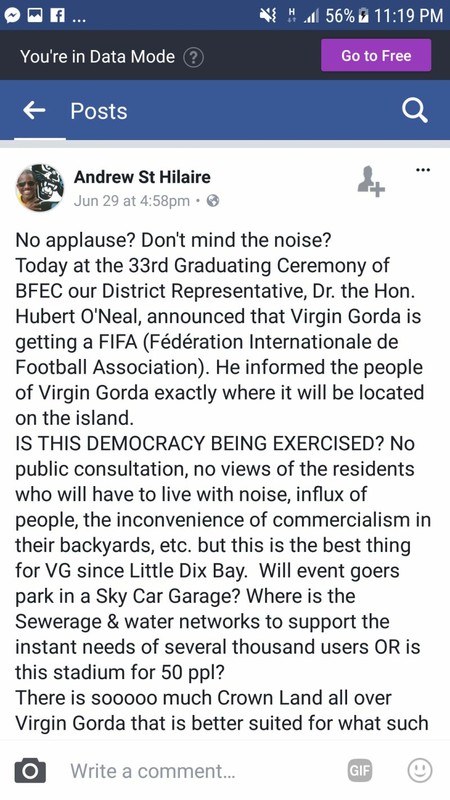 Where is the Sewerage & water networks to support the instant needs of several thousand users OR is this stadium for 50 ppl?There is sooooo much Crown Land all over Virgin Gorda that is better suited for what such a facility requires especially at VG standard as the Crown Jewel," he said. Some persons supported his view but were particularly upset that the Representative used that forum to announce the project. "Listennnnnn, this was very distasteful at the students graduation ceremony. VG was not having it. Some faint claps were given," Commented Niqua Vee. 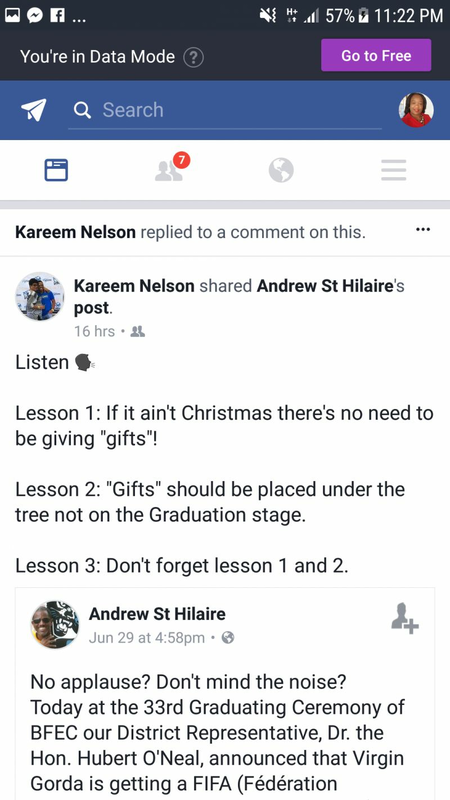 In a separate post, Shereen Flax-Charles wrote, "Graduation should be about celebrating our children's accomplishments NOT for political posturing and campaigning!!!" This attracted a flurry of comments, with Wendell M. Gaskin fanning a flame throughout the chat. "We who always willing to criticise, never giving a positive solution to whatever the problem is. In the BVI I am constantly being reminded òf that story of those blind men who went to see an elephant for the first time," He said, attracting a response from legislator Hon Alvera Maduro-Caines (R6) who wrote, "Say no more G."
But Mrs Flax-Charles was not going to leave it at that, "Wendell M Gaskin I am all about solutions but when you criticise and give solutions in the BVI they are often ignored because it was not the idea of the politician or the person in authority. There are also those of us who offer solutions and actually enact solutions without looking for praise and credit. 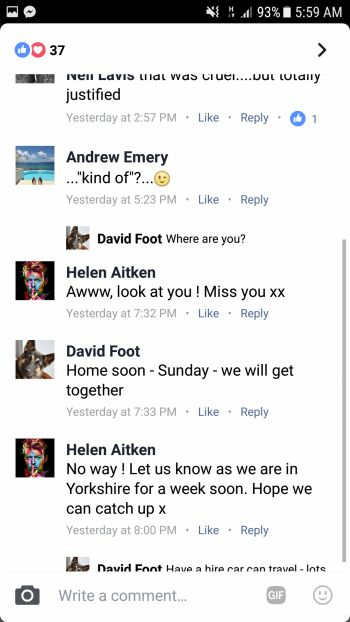 There are those of us who are more about BVI than about self," she hit back. Then there was Mr Dickson Igwe who added his penny. "Solutions-solutions-solutions- we have been bombed with solutions for 20 years- no one wants to listen- so now the dollar bill rules- welcome to the new BVI - ain't gonna be pretty." 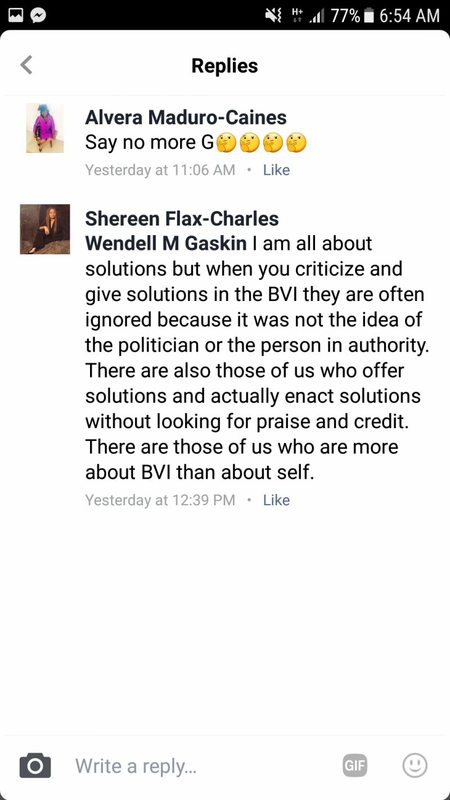 And the exchange continued, with Mr Gaskin saying, "Again I want to remind some of you who have amnesia, that the problems in the BVI did not start 6 years ago. All of a sudden every one find their tongue." Mr Igwe added: "When you walk away from your culture and values that were built up over generations and allow every alien subtext to rule in your house the result is present day BVI - a people confused about where they are headed." 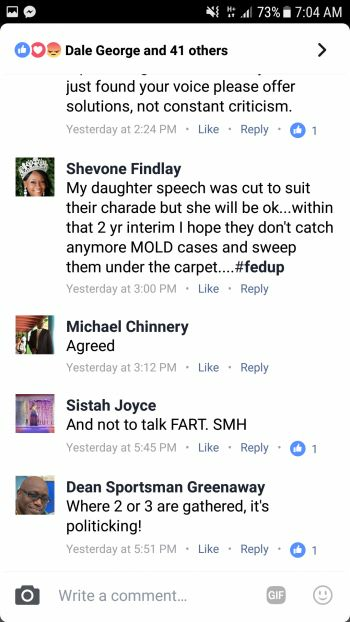 Gloria Fahie added: "The problems did not start 6 years ago but perhaps they have become over bearing"
Mrs Flax-Charles commented: "Everyone knows that the problems didn't start 6 years ago and as a country there will always be problems. When individuals who are normally not vocal start to speak up we should welcome it as it may bring a different perspective to the issue or problem. We need to stop the talk about what happened 6, 20, even 40 years ago, who was in government, who did or didn't do and fix our BVI. Remember lots of people in the BVI will never find their tongue as they are afraid to speak." And the back and forth continued but this comment by Shevone A. Findlay couldn't go un-noticed: "My daughter speech was cut to suit their charade but she will be ok...within that 2 yr interim I hope they don't catch anymore MOLD cases and sweep them under the carpet....#fedup." 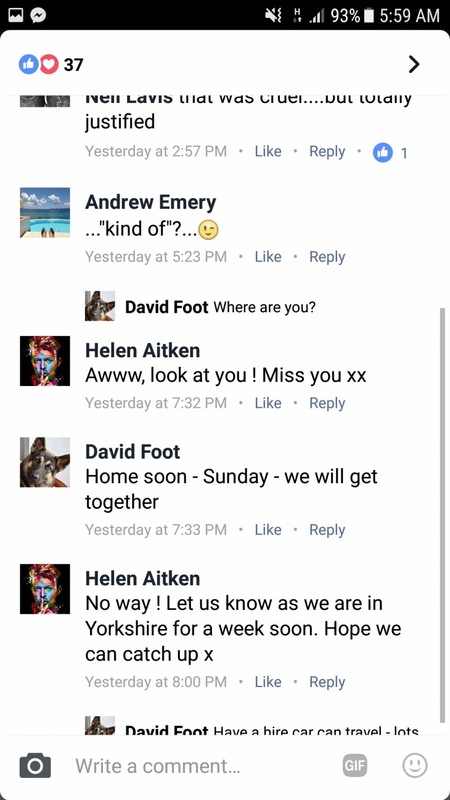 so sad to hear this at this time when we feelin so happy for our children. Yo can answer your own thoughts-- or the obvious follow-up. the focus on the people is being lost. How many stadiums are needed in East End and VG? that is a lot of land which will probably be needed years from now for housing etc. 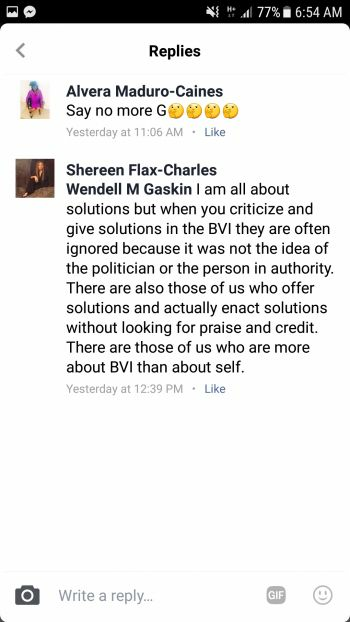 I still am asking how many athletes does BVI have that they are so catered to at the expense of the rest of the population? But more importantly--WHERE ARE THE PUBLIC MEETINGS FOR ANYTHING THIS IMPACTING?? This government never seems to take public opinion seriously as they spend their tax money. even at a simple graduation they want our children to lose their humanity with these old no good politicians. I am troubled by who is in power and their advocated values. @ Youths for Waylan, Dream on BoBo. You sound like you are knee deep in the Honey mustard sauce. BoBo, you can take my comment anyway you like. Parents ... step up and stop letting others sway and train your offspring to their way of thinking. Pay your children attention. Talk to them. Teach them how to think for themselves. Shut your @&$ up - as a citizen of this country we have a constitutional right. Secondly, we do not need your permission to use facebook. @rattie, they have a right to speak out and rant as much as they damn well please on Facebook. This is not North Korea. There is a time and place for everything under the sun. There is a time for political campaigning, and student graduating; this was time for students graduation. Let the students have their day and their monumental milestone. The Hon Hubert O'Neal misfired. The students are owed an apology, for letting politics ruin their graduation. Students only graduate, for the most part (some students graduate from high school in both Caribbean and the US), once. There are nuff times for political campaigning. FIFA HAD NOT AGREED TO BUILD ANYTHING ON VIRGIN GORDA. Dr. O'Neal, as usual, putting the cart before the horse. I wonder why politicians are invited to speak at graduations. Once they get the mike, they will talk politics. VG don't any Stadium! What we need are decent paying jobs so that we can pay our bills and live comfortable. Govt cant even maintain the schools, admin, roads ect you going to add more? Time for you to sit and really think if you really want to be in politics my boy seriously? Do you need a proofer for your thoughts before you open your lips? Dr O'neal has good intentions but his party lacked vision and if anyone wish to criticize me they just have to look at the state of the BVI and tell me where is the once great country we had in the 80s & 90s? Well it is a hot debate.Anywhere in the world where a government tries to run a country without the involvement of its people there will be desaster. I have always advocated for the collaborative effort of the goverment and the people working togeather for the development of the country. What we are experiencing presently is the government is doing whatever it please to do and the people will follow. If this concept is allow to continue, therewill always be conflict and lack of development. Before he forward there to talk folly. I does wonder about this man like seriously. He shame box must be buss. Clown! Man Bertie you can't even help to finish the swimming pool at BFEC school for years now you coming with this crap. PLEASE PEOPLE lets really start looking for a true DISTRICT REP. Someone that speaks for himself and for the people. Then again New School that was even part of his portfolio for election. Man we had enough silent treatment, no updates on anything for District 9. A public meeting schedule every 3 long months to then still not get your answer on the spot and questions from 3 months pier are still not answered. So we ask ourselves where is the way forward? Not with bertie!. Sailing capital of the world, thats why TOLA is the Yacht and VG & Anegada getting pulled in the DINKY with no engine. Lets put the wright people in place to save our own people lives. Give a pig water and it will wallow!Stop putting square pegs in round hole and our communities will be better off. Go for dreamers not goldbricks. Laziness and lack of vision is blindness.